Amy's Greenhouse, with patio and gazebo, at the Henry Barnard Early Childhood Center. 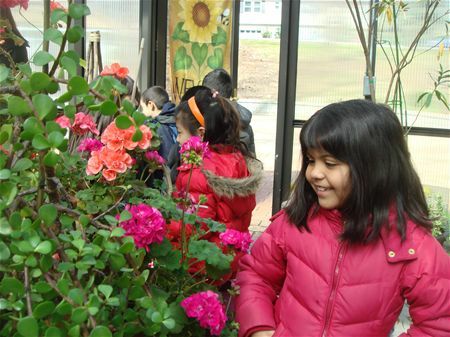 Amy's Greenhouse at the Henry Barnard Early Childhood Center has received a donation to upgrade its ventilation system and enhance its energy efficiency from Rough Brothers, Inc., the largest greenhouse design, engineering and manufacturing company in North America. The CEO of Wadsworth Controls, Patricia Dean, donated the environmental control system to work with the equipment being installed. News of the donation was made official when, during its November 13 meeting, the Board of Education approved the resolution to accept the generous gift worth $25,000. "We've been eagerly awaiting the green light on this upgrade since August," shared an enthusiastic Kathleen Connolly, who is a Pre-K teacher at the Barnard Early Childhood Center. "We are so excited! Being able to regulate the temperature more accurately is going to make a world of difference for the overall function of Amy's Greenhouse." 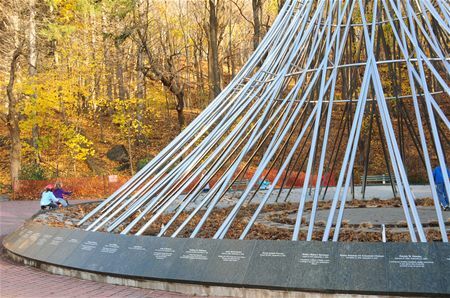 Amy's Greenhouse, a sizable 662-square-foot glass and metal greenhouse, was erected in 2005 in memory of Amy O'Doherty, who perished at the age of 23 in the terrorist attacks on September 11, 2001. Amy's mother Geraldine Davie, a former Barnard Elementary Pre-K teacher, helped create the facility through generous gifts donated in Amy's memory. 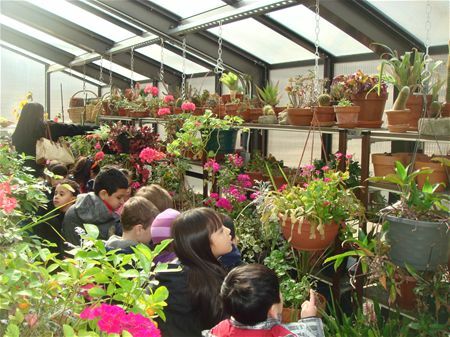 Since 2005, Amy's Greenhouse has been utilized for many educational and extracurricular programs, as well as the school's annual 9-11 ceremony. 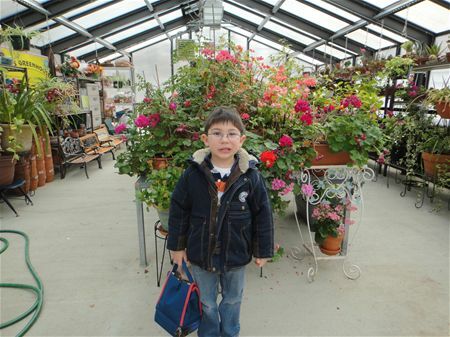 "Amy's Greenhouse is a beloved district site," said Connolly. "Along with being an enduring living memorial, the greenhouse is part classroom, part science lab, part seed starter, part plant conservatory, and much more." The system, which will be installed this winter, includes a new environmental control system, horizontal air flow management fans, and evaporator cooler. Together, these components will be controlled as a single, integrated system. Rob Tanzer, who heads the Institutional Greenhouse and Conservatory Restoration & Renovation group at Rough Brothers and is known as the company's "greenhouse geek," has been the district's point person. Tanzer's team of experienced engineers, designers, manufacturers, and constructors is an industry leader in monumental conservatory renovations, construction, and recreation. "Everyone at Rough Brothers is so pleased to be able to do this for New Rochelle," said Tanzer. 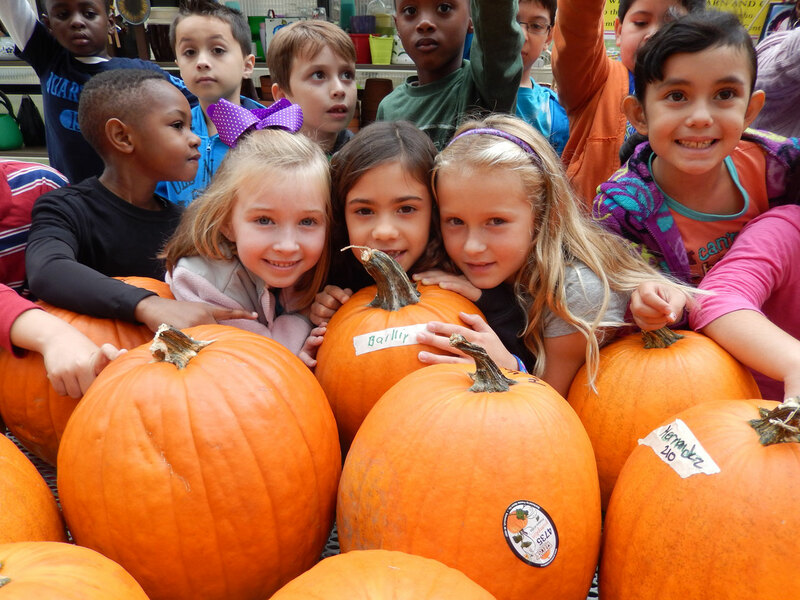 "The greenhouse means so much to so many people in this district and community; it's an honor to provide these materials and installation - at no charge to the district - so that programs and positivity can continue to grow in Amy's Greenhouse." Connolly said the district is thrilled to have made this connection with Rough Brothers. "After this new ventilation system is installed, Mr. Tanzer has said that Rough Brothers will continue to work with us," she added. She is particularly looking forward to working with their team to create an ongoing maintenance schedule. That would keep Amy's Greenhouse performing at its best, so it can continue to provide a place of learning, reflection and solace. 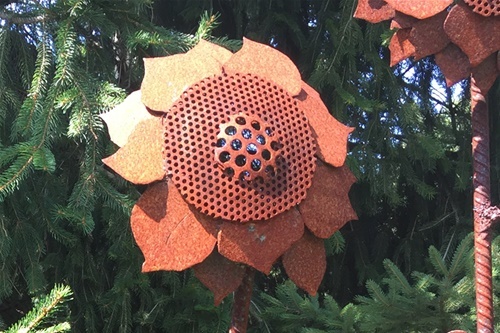 Recently Millie purchased a large scale metal sunflower scupture which will be displayed inside Amy's Greenhouse. 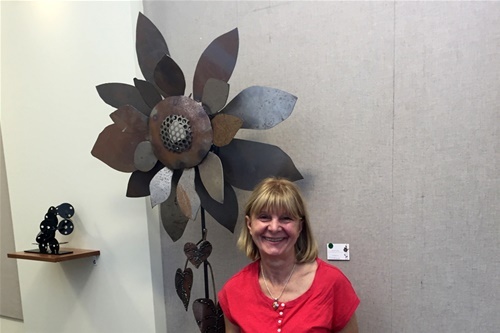 The award winning artist Laura Lavan uses reclaimed materials and the profits from her work is being donated to the new Westchester Children's Museum, where she sits on the board. 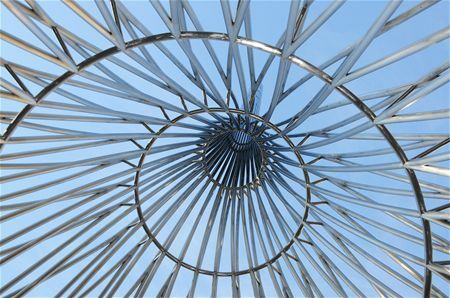 The piece will be installed in the middle of the center table in October 2016. 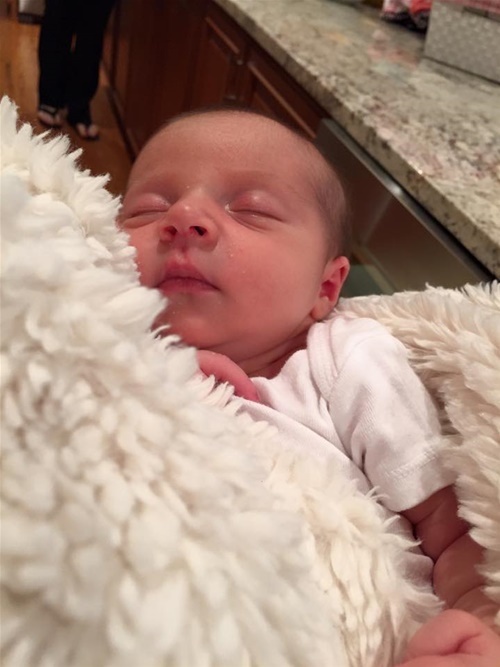 "I am filled with joy and tears at the arrival of my granddaughter Amy Davie Lee. She is a sweet, sweet baby who is petite, pretty, and precious. Unlike her older brother, right now she has dark hair and dark eyes. She is a strong eater and has already gained 9 oz., so she is back up to her birth weight. 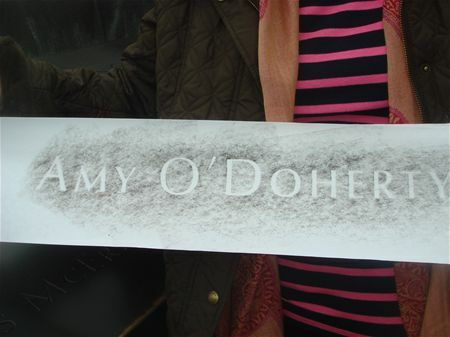 Maura and David have honored both me and Maura's sister, Amy O'Doherty, by giving her the name Amy Davie Lee. We are happy beyond measure to have her with us." 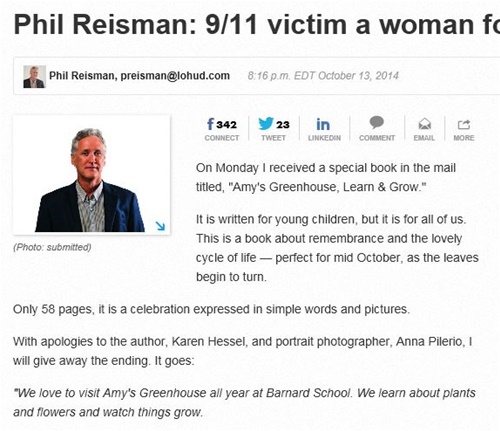 We sent the new Learn & Grow: Amy's Greenhouse book to Journal News columnist Phil Reisman and he was kind enough to write an article in the Journal News about it in October. 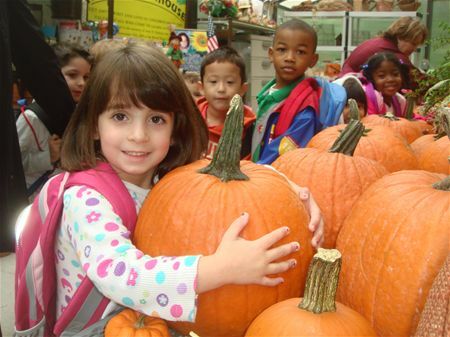 Former Barnard principal Harriet Glick visited Barnard School and Amy's Greenhouse on Tuesday, October 22nd, 2013. Ms. Glick was the principal during the twin tower attacks and worked directly with Geraldine Davie, mother of Amy O'Doherty. During her visit, Ms. Glick marveled Amy's Greenhouse and was so pleased that the project came to full fruition. The sad memories of the tragic day are indelible to those that lived through it. In this case, Amy's Greenhouse offers some respite from the sadness. 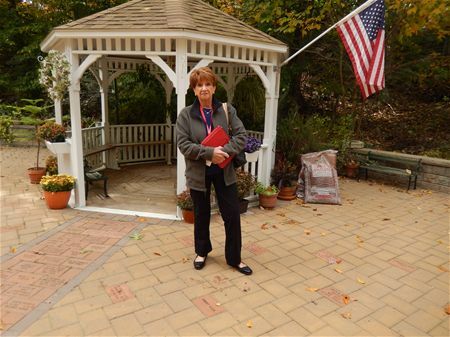 Amy O'Doherty was posthumously honored with a Proclamation from the city of New Rochelle at this year's 9-11 ceremony at Amy's Greenhouse. It was read to Amy O'Doherty's mother Geraldine Davie by Superintendent Organisciak. Whereas: we wish to honor the memory of Amy O’Doherty and thank the New Rochelle community for the gift of the Amy’s Greenhouse project for generations to experience. In the city of New Rochelle and ask that all residents celebrate the memory of this young woman whose life was ended too soon but whose legacy adds so significantly to the fabric of our community. Done at New Rochelle, New York this 11th day of September, 2013. Barnard remembers 9-11 at the Amy's Greenhouse annual ceremony. Here is an article featured on Patch about the event. Carl Calo, owner of Ace Banner, Flag and Graphics has been a friend of Amy's Greenhouse for many years. He has donated banners for our Mother's Day Plant Sale and 9-11 ceremonies. He created a mosaic banner which we gave to Frank Miceli for donating our patio. Carl Calo also gives a new American flag each year to Amy's Greenhouse. When we installed our new gazebo a few years ago, he created an enormous bow out of foam. It was gorgeous. We appreciate our friend -- Carl Calo. Click here to read here a recent article about Carl Calo. 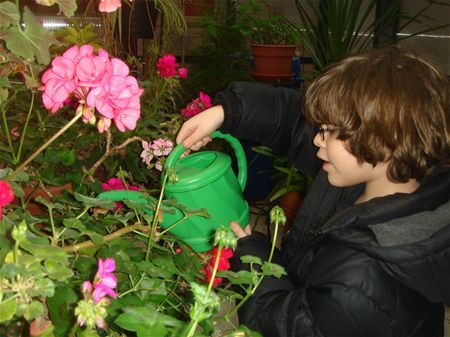 The Loop NY electronic newspaper featured our Mother's Day Plant Sale this year. Click here for the article. Thanks for covering Amy's Greenhouse! Amy's Greenhouse is featured in the March 19th, 2012 issue of Westchester Magazine. 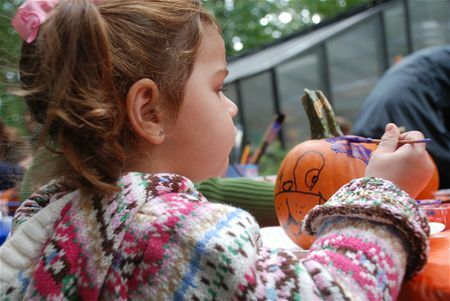 The article highlights the 'Beechmont Neighborhood' as a great place to raise kids. 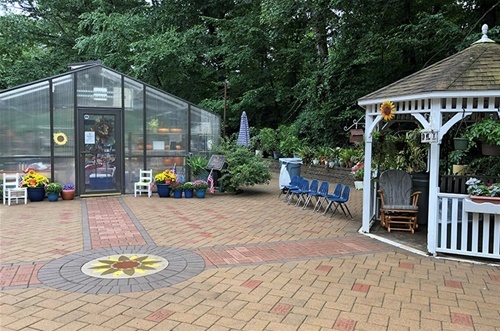 The article says "One of the best features in the neighborhood is Amy’s Greenhouse and Gazebo at the Barnard Early Childhood Center. 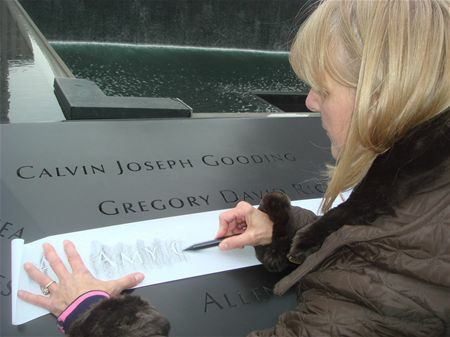 It’s a living memorial to Amy O’Doherty, who perished on 9/11. 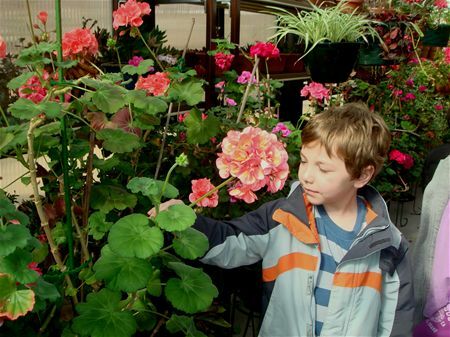 The greenhouse offers year-round events, but don’t miss the annual Mother’s Day Plant Sale." 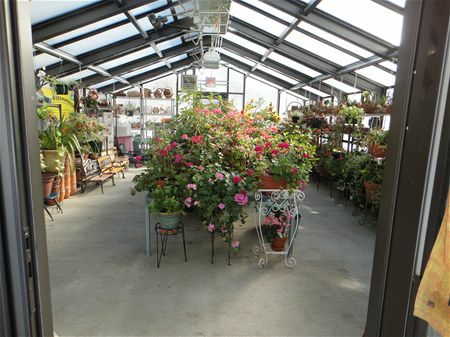 A photo of the greenhouse is featured, also. 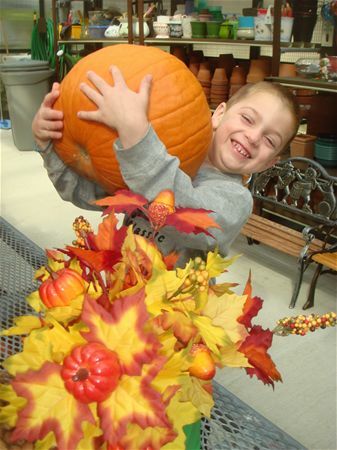 Amy’s Greenhouse would like to share a special story with you. A beloved Teacher’s Assistant at Barnard, Anita Ciafardini, performed a simple act of faith that created this beautiful story we have to share with you today. Anita found a sad, forgotten plant in the garbage that someone had thrown away. Instead of passing this forgotten plant by, Anita rescued it. 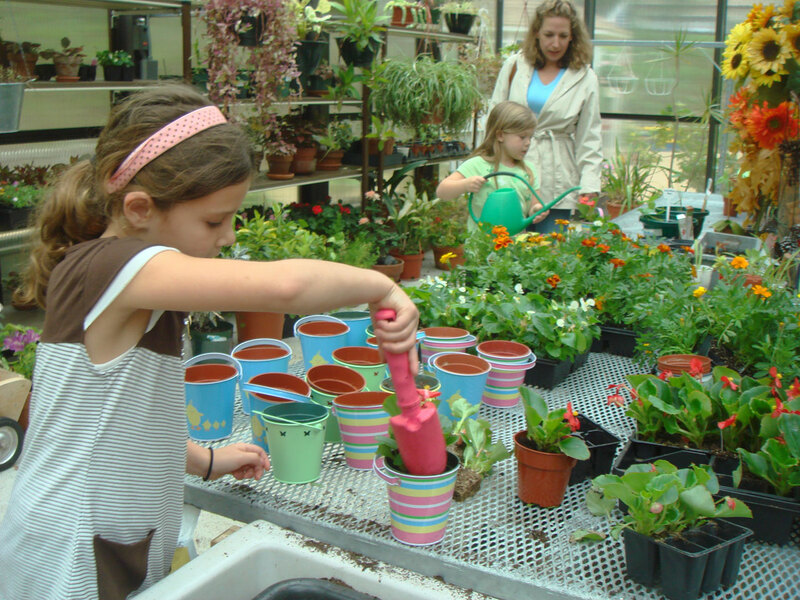 She brought the plant to Millie at Amy’s Greenhouse in hopes the plant was not beyond repair. Anita even told Millie that if the plant couldn’t be restored to its healthy state, then at least the pot could be salvaged for another plant. Millie worked her magic and carefully tended to the withered plant. 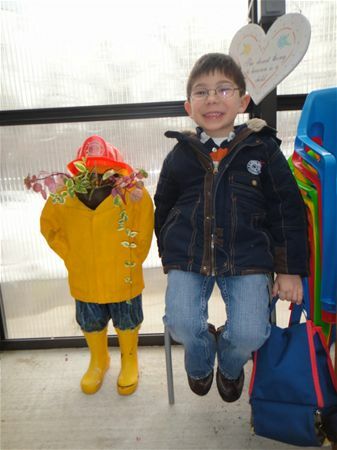 That first winter, the plant surprised everyone and enormous, vibrant Orchards bloomed throughout December and January. 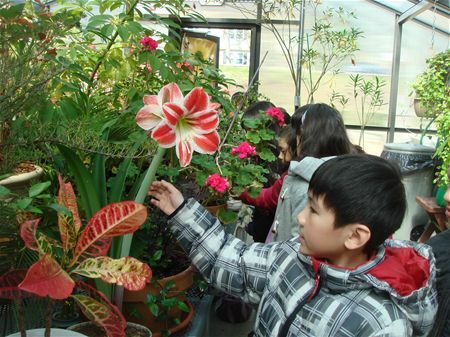 Every December and January, that original, forgotten plant continues to bloom vivacious flowers for all to enjoy. Last year, Millie transferred part of the original plant into its own pot. Like the original plant, the smaller plant has grown and blossomed. 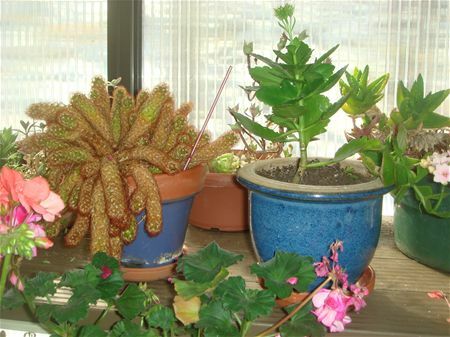 This smaller plant is now displayed on a table in the entrance of Barnard next to Tony’s desk. 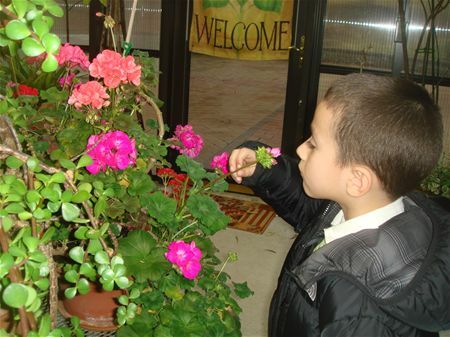 Every child and adult, who walks through Barnard’s loving doors, enjoys the brilliant, flourishing smaller plant that came from the original plant that Anita saved from the garbage. The lesson of this story is that everything deserves a chance to grow, develop and thrive. With love, caring and hard work, this plant flourished and now gives joy to all who see it. This lesson is also true of the children here at Barnard. 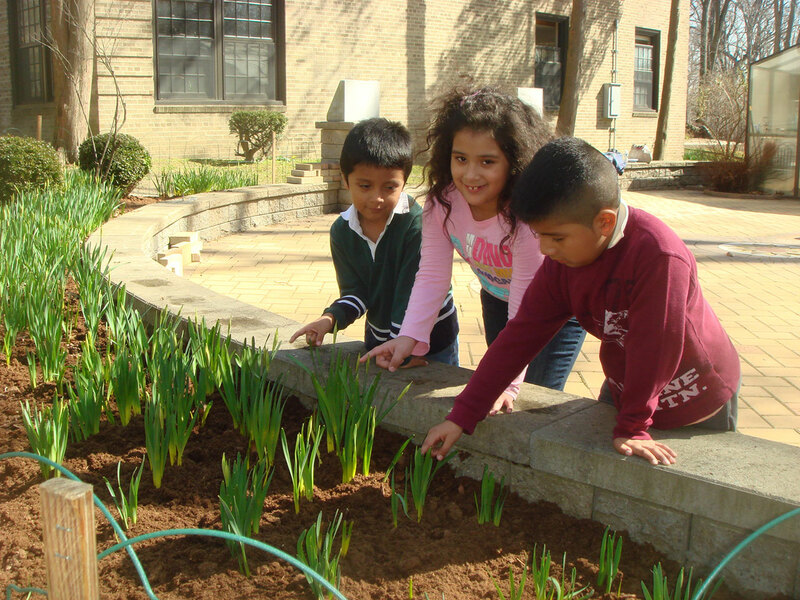 Like the original plant, our Barnard children need a healthy start so they may grow and bloom in the future. 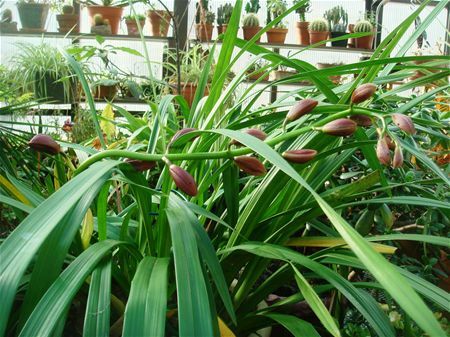 This is the original, forgotten plant thriving in Amy’s Greenhouse. 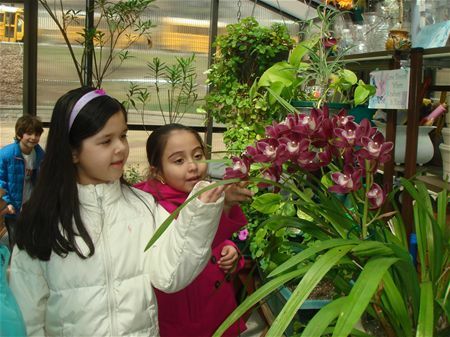 Barnard students enjoying the amazing blooming Cymbidium Orchards on the original plant in Amy’s Greenhouse. 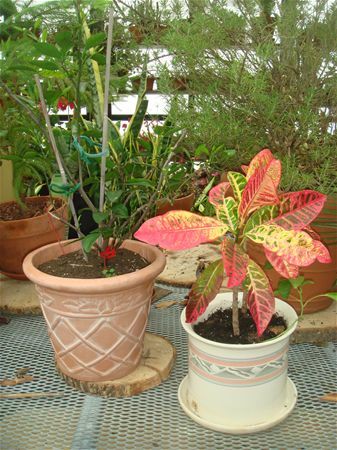 The smaller plant that came from the original plant saved by Anita Ciafardini. 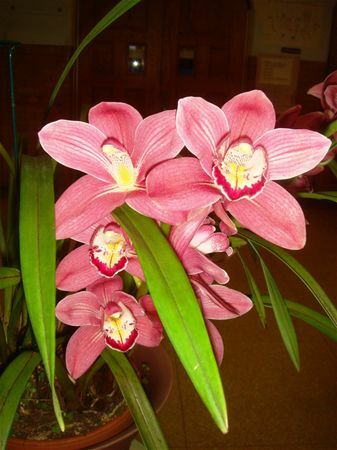 Every December throughout January, the plants bloom these brilliant Cymbidium Orchards for all to enjoy. The small plant in Barnard’s entrance next to Tony’s desk. 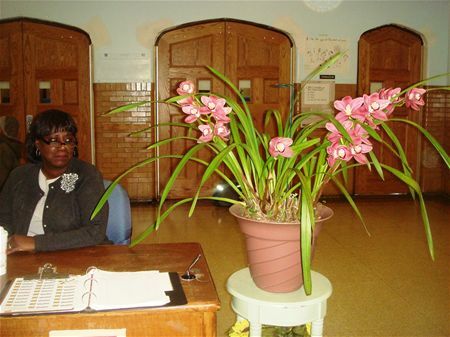 Everyone who enters Barnard gets to enjoy this treasured plant. I hope you are well, happy and healthy. I saw the photo of you at Ground Zero copying Amy's name. When I go to the WTC I "feel" Amy in my heart especially knowing she took her last breath in the special air above the site. I'm sure Amy looks down upon you every time you work with the children at the Greenhouse that bears her name. 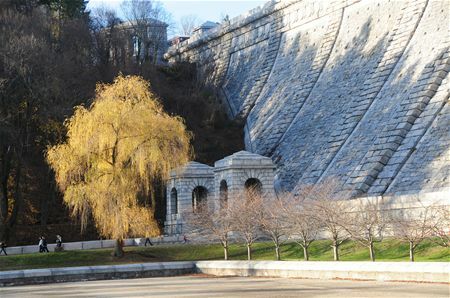 These photos are from a November 25th family trip to the Kensico Dam in Valhalla, NY. 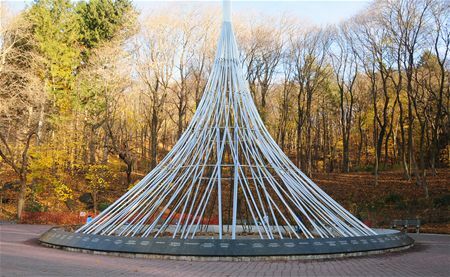 At the dam there is a monument for Westchester 9-11 victims. We visited the Amy O'Doherty plaque at 'The Rising'. You can walk around it or go inside it. 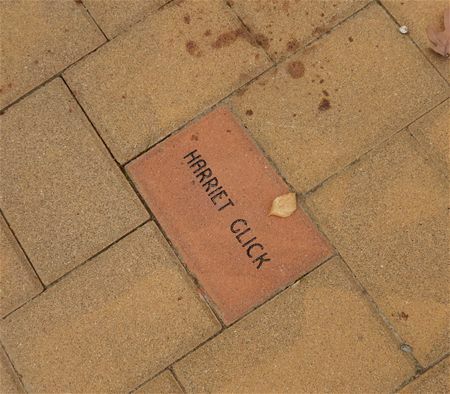 Around the base are marble plaques with the names of the victims and short quotes. Here is Amy O'Doherty's plaque. 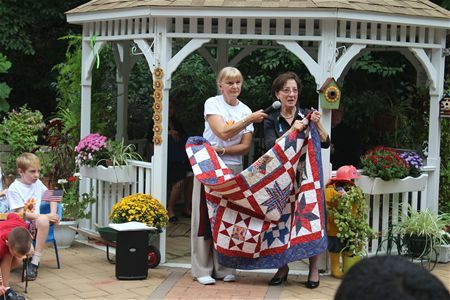 I brought your magnificent quilt to Amy's Greenhouse last month on the tenth anniversary of Sept. 11. I still remember when you presented it to me in the Principal's office in late 2001 and the feeling of warmth that surrounded me when I put it on my shoulders. The quilt is still beautiful today and everyone who sees it marvels at it's workmanship and beauty. I keep it near me everyday as a comfort and reminder of our wonderful country and the sacrifices made for the freedom of our republic. I hope this finds you well and ready to enjoy Thanksgiving with your family and friends. P.S. Please visit Amy's Greenhouse at Barnard School to see the tribute we built to Amy. Her spirit lives there. I'm sure the director of the Greenhouse, Millie Radonjic, would enjoy meeting you. 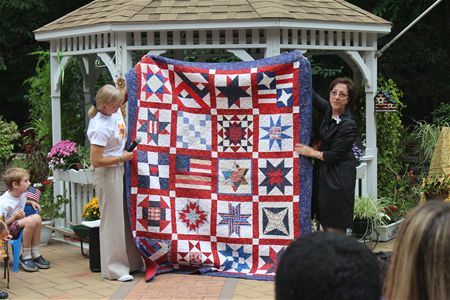 I showed the quilt you presented me just 10 short years ago to a gathering at a 10th anniversary remembrance at Barnard School in New Rochelle. The quilt is still vibrant and beautiful and everyone remarks about the high quality workmanship of the piece. The quilt provides warmth and comfort to me to this day. If you get a chance please visit "Amy's Greenhouse" at Barnard school and meet the director of the greenhouse Millie Radonjic. 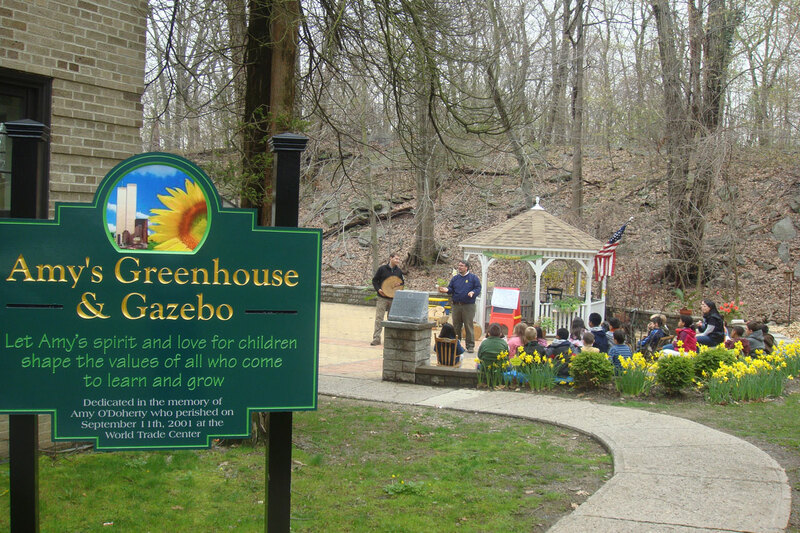 The Greenhouse is dedicated to Amy O'Doherty and is a special place where children learn to plant seeds instead of throwing rocks. The director, Millie, is the angel who runs the project. News 12 covered our 10th anniversary ceremony. Here is the video clip, in case you missed it. Geraldine Davie, recalls what it was like to lose a child in the terrorist attacks on Sept. 11th, 2001. 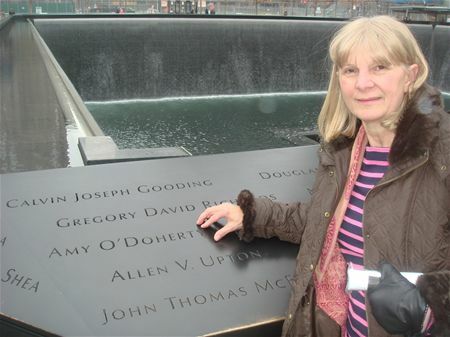 Her daughter, Amy O'Doherty, was 23 when she was killed in World Trade Center. On the altar where Amy O'Doherty would have been maid of honor this past June, a candle glowed in her absence. It was her family's way of honoring her memory at her sister's wedding, without letting grief overwhelm the joy. "That's how we've been managing things with everything we do," said O'Doherty's mother, Geraldine Davie. "We say, 'What part is Amy going to play in this?' "
In September 2001, O'Doherty was just venturing into the professional world, living in her first Manhattan apartment at 23. Flowers arrived regularly at Davie's Pelham home afterward as messages of comfort. Ten years later, it's as if they continue to bloom. 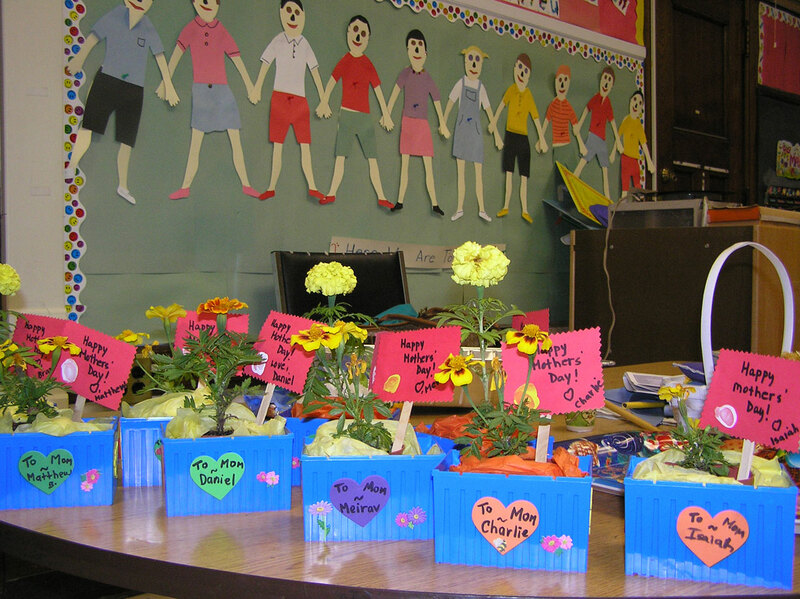 Donations in lieu of flowers were set aside for the Barnard School in New Rochelle, where Davie taught, and the gifts paid for a greenhouse in Amy's memory. 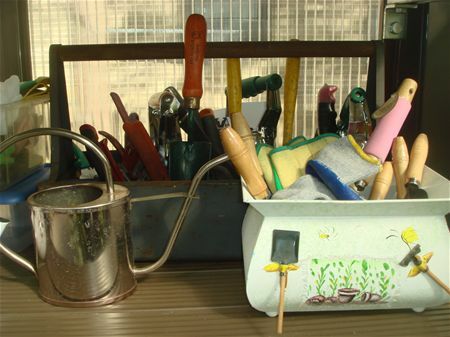 "Amy's Greenhouse" is a powerful symbol to the children. "They are surrounded by so much that is detrimental to their little spirits," Davie said. "And I hope that this is a place where their spirits can grow, along with the seeds that they plant." Davie, who moved to Virginia to be near her older daughter, Maura Lee, will return to Ground Zero for the anniversary. And she will continue visiting the greenhouse that, she feels, has "extended Amy's life here on earth." See below for an email from a website visitor that offered an artistic tribute to Amy and her family. The high school student created the picture below. The video shows how she created it with software and the internet. My name is Reagan, I'm a high school freshmen. Still thinking of you. Great times living across the hall from you and pledging Kappa Phi together. I shared my essay again in class. I usually share this essay in Creative Essay. It's been a few years since I taught this class. I read our tongue piercing story again to the class. I didn't even get to the second page and I started choking up. I wish you stayed at SHU. My last memory of you...you were driving away from Gail's apartment in your Jeep. That was May 2001. How sad that your life would end only a few short months later. I still carry Amy's name in my wallet - 10 years later. All my best wishes for her family and friends. I can't believe it's been almost 10 years and I still tear up as if it were yesterday. As you know Amy, your mom and sister are two of the most amazing people in the world! I now work with Maura and her amazing new husband, spend Thanksgiving with your mom, sister, uncle, cousins, their kids, etc. and there is never a moment that you are not there with us! I am thankful for our connection through Pelham hockey (and you always being such a good sport!) that they have become such a special part of my life. Thinking of you often, hope that bright smile hasn't changed a bit. On January 21st Elvira D'Amore-Perdomo mother of Lucas (Kindergarten student at Barnard) emailed Millie and told her: "My friend's mother-in-law has a beautiful greenhouse in Rockland County and is in the process of moving to California. She would like to donate as many of the plants as possible." After receiving the email Millie contacted Elvira’s friend, Elizabeth and made arrangements to pick up the plants and garden supplies she was donating to Amy's Greenhouse. Millie found out that the greenhouse belonged to Elizabeth’s mother-in-law, Dr. Bella Clutario Scarpelli. 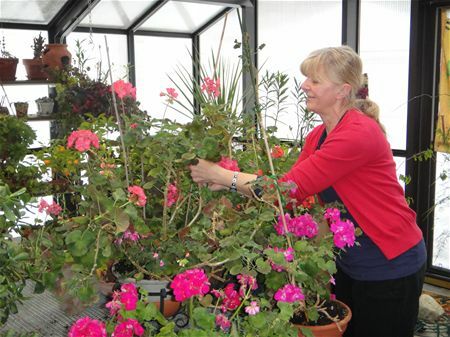 On January 23rd, Millie, Debbie and Jerry transported the plants and garden supplies from Bella’s Greenhouse. Paul, her son, contacted Millie and wrote a small biography about his mother and her life. While is brings great pleasure that we've found a home for my mother's plant, it also comes with mixed feelings of donating the plants from Bella's home to Amy's Greenhouse. Mrs. Bella Scarpelli is widowed to the late Emile M. Scarpelli, M.D., Ph.D. In addition to being a loving and devoted wife of 39 years, she is a generous and caring mother of seven children and 11 grandchildren. She is now a retired pediatric pulmonologist where her last position was as Chief of Pulmonology (Dr. Bella Clutario) at Blythedale Children's Hospital in Valhalla, N.Y., where she co-founded and directed the first Ventilator Dependent Children's Service in the greater New York region - the first such center in the U.S. directed and staffed by pediatricians. She is loving called by her vent-kids, Dr. Bella. We can't tell you how pleased she was when we told her that her greenhouse has been donated to Amy's Greenhouse. Bella has brought so much love and care to our family and friends and everyone who came to the Orangeburg house was always welcomed with open arms. So it's no wonder her greenhouse had flourished over the years. 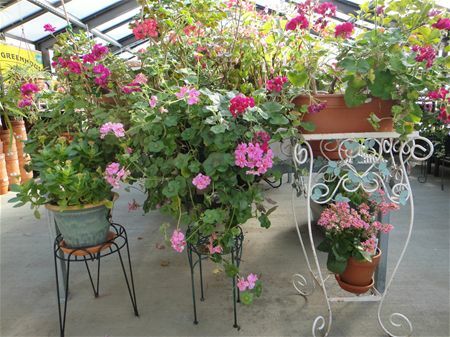 Thanks to Bella’s plants Amy’s Greenhouse is full of vivid colors blooming in the coldest part of the year. It is obvious that Bella’s favored geraniums. 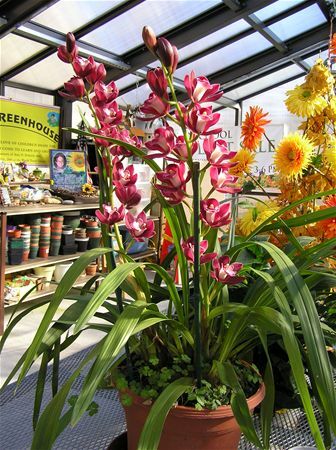 We use Bella's stands for displaying her plants and some existing flowers. Included in Bella's donation to Amy's Greenhouse we received many flower pots. 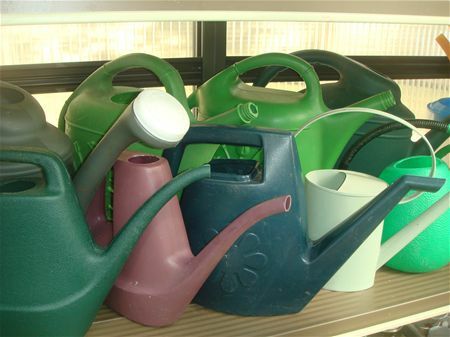 Bella's watering cans and gardening tools are added to existing gardening supplies. 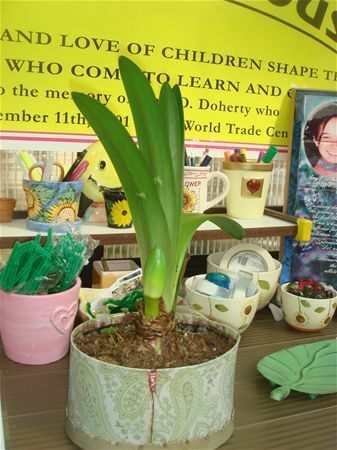 She was very creative using different decorative items for planting including a gift box to plant this Amaryllis. 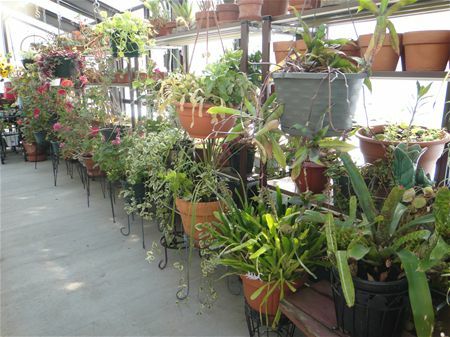 Barnard's students have begun visiting Amy's Greenhouse and are enjoying Bella's and other plants displayed throughout the Greenhouse at various stages in their growth. 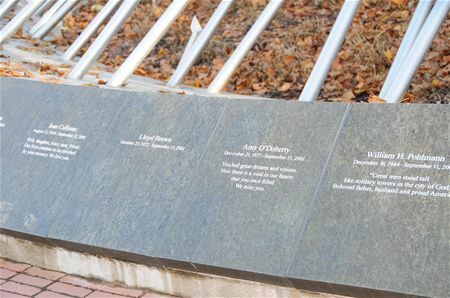 With 9-11 nine years behind us, the Amy’s Greenhouse committee marvels how fitting it is, that the very close friends of Amy O’Doherty, Maria Costa and Melissa Vigue, both have children of their own at Barnard. Amy O’Doherty was the 23 year old daughter of since retired Barnard Pre-K teacher, Geraldine Davie. Amy perished in the twin tower tragedy. After the terrible event, her family and friends put up posters, signs and web postings searching for her. Her family and friends appeared in newspaper photos and on television, tearfully searching for their lost loved one. 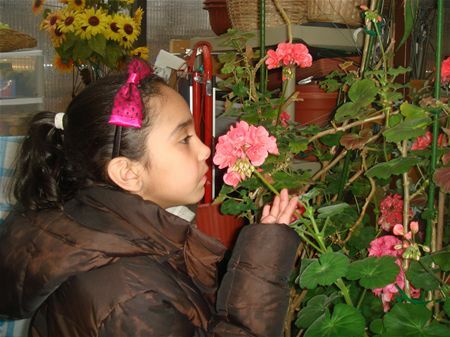 When any hope of finding Amy alive was gone, the same friends and family began raising monies for today’s Amy’s Greenhouse at Barnard Elementary. Melissa Della Donna Vigue, Maria Gallello-Costa, her sister Elizabeth Amy’s close friends raised nearly $15,000 towards the $27,000 total for the greenhouse. They held fundraisers at local eating establishments and collected money from friends and neighbors. 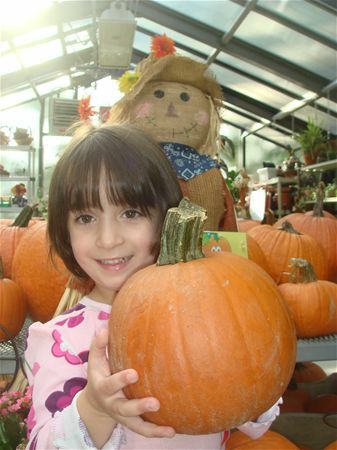 Now nine years later, Pre-K students Grace and her brother Jason children of Maria Costa and her husband Jason will be weighing pumpkins and planting flowers. Pre-K twins Olivia and Lily, children of Melissa Vigue and her husband David can enjoy doing projects in Amy’s Greenhouse, too. This truly reflects that Amy’s Greenhouse is a way to bring good from tragedy and be a place for children to learn and grow. Thank you Melissa and Maria from the entire Barnard community! The article is wonderful. I am honored!!!! Thank you for everything. I can't believe my kids can share in one of my most precious memories. I miss her so much. I still wish they could meet her. I still have in my head they will. 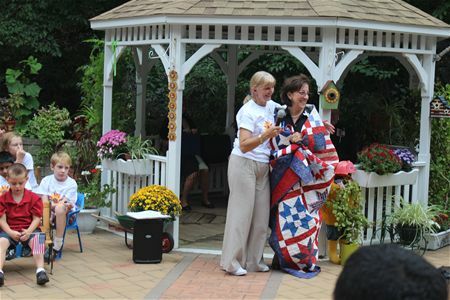 See Page 8 for article about 9-11 8th anniversary ceremony at Amy's Greenhouse. Click here for article. Here is a press release from Sound Shore Hospital that covers the 9-11 8th anniversary ceremony at Amy's Greenhouse. Click here for article. 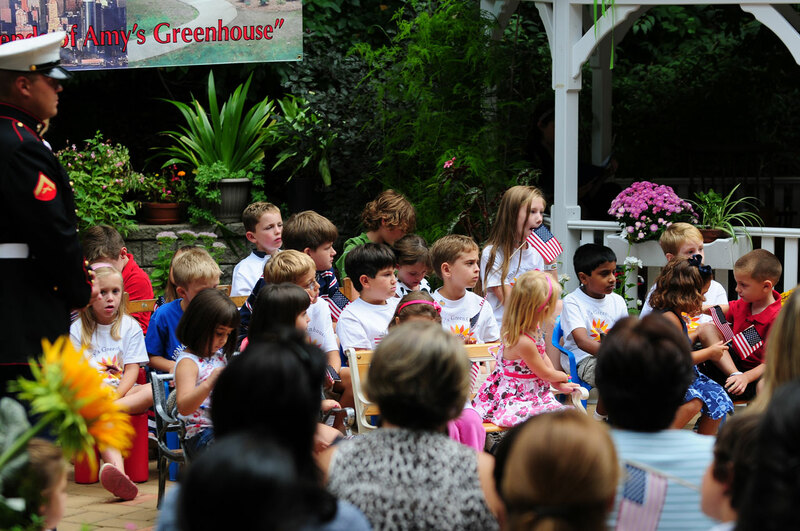 The Sound Report covered the 9-11 8th anniversary ceremony at Amy's Greenhouse. Click here for full article. 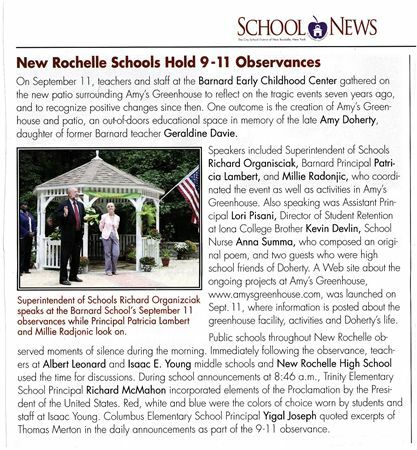 Amy's Greenhouse is frequently featured in the New Rochelle School District newsletter received in all the households of New Rochelle. Here is a article ( September 2008).